Solo: A Star Wars Story altered the fabric of the Star Wars cinematic universe by showing us a Darth Maul that wasn’t just alive, but also no longer cut in half. (Cartoons be damned.) But the film was also fleshing out the franchise in other ways, whether that be adding weight to Han and Lando’s relationship or by entirely changing the way we look at the Millennium Falcon. Plenty of fans have pointed out the moment when Lando’s beloved L3-37 (voiced by Phoebe Waller-Bridge) uploaded her navigational data to the Falcon, as well as how Lando subsequently began referring to the ship as “her.” The implication here is that L3-37's consciousness is now part of the Falcon, and not just in spirit, either. Way back in The Empire Strikes Back, foppish droid C-3PO has a line that hints at a personality for the ship. “I don’t know where your ship learned to communicate, but it has the most peculiar dialect,” he said, which can be interpreted as a reference to the accent Waller-Bridge brought to the droid or simply to the fact that she is, well, a she. Until now, this has simply been a theory. But, late last week, the official Star Wars Twitter account confirmed it, posting a screenshot of C-3PO’s quote with the caption, “MiL3nnium Falcon” and a #ThrowbackThursday hashtag. 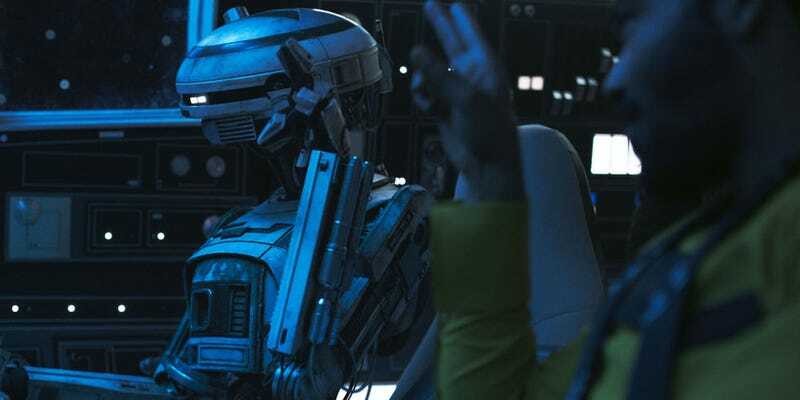 SlashFilm also raised the connection with screenwriters Lawrence Kasdan and Jonathan Kasdan, who confirmed that Waller-Bridge’s feminist robot is definitely living in the circuitry of the ship. It also, for better or worse, opens up plenty of avenues for R2D2/L3-37 fan fiction. Yay?